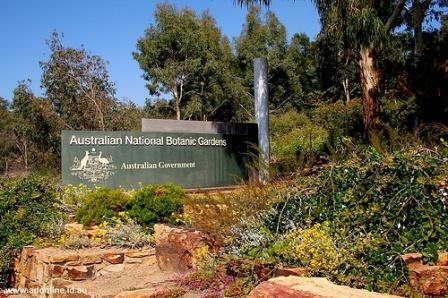 National Botanic Gardens of Australia is located in Canberra and is the property of the Australian government. In the garden is the largest collection of Australian flora, and the mission of the garden lies in its research and dissemination of knowledge. 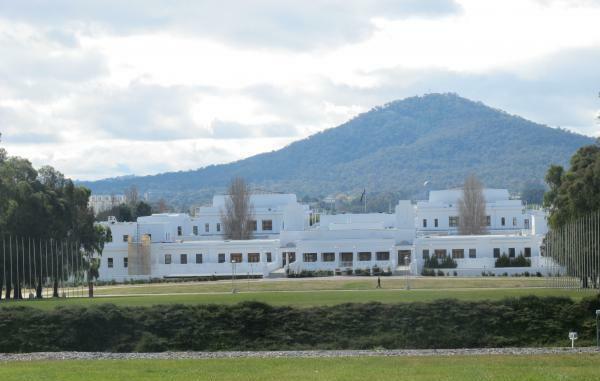 When he developed the plan for the construction of Canberra in the 1930-ies, the creation of the Botanical garden was recommended by the Advisory Council of the Federal Capital Territory. The garden has been determined on the Black Mountain, and in September 1949 was held a ceremonial planting of the first trees. Then work began on designing a garden, a collection of collections and construction of complex services for visitors. The garden was officially opened in October 1970, Prime Minister John Hortona. Today the administration of the garden owns 90 acres of land at Black Mountain, 40 of which are directly Botanical garden. Plans to use the rest of the land is being developed in anticipation of funding. The Botanical garden is divided into thematic sections, which according to the taxonomy or natural ecosystems planted more than 5.5 thousand plants. 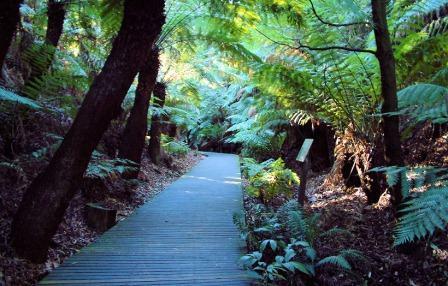 Here you can see a small valley with tropical rain forest, rock Garden plants, occurring in various habitats, from deserts to Alpine meadows of endemic flora sandy areas around Sydney, many eucalypts (about1/5 all kinds of eucalyptus trees growing in Australia), flowering shrubs of banksii, telopea and graveley, Myrtle trees and delicate acacia. 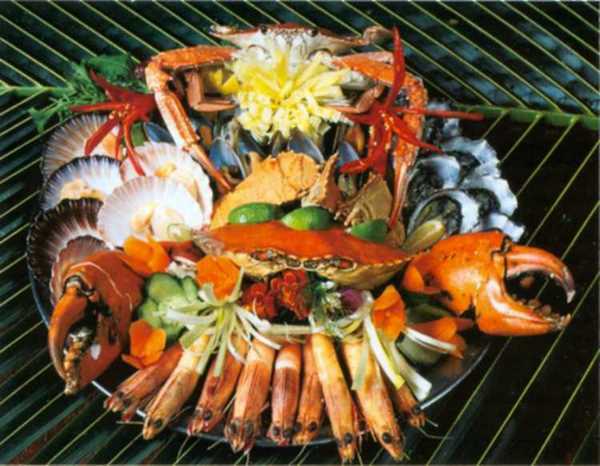 Australian national Herbarium is also located on the territory of the Botanical garden. Here is the biggest in the country collection of dried plants. The herbarium is involved in the creation of electronic database of Botanical diversity of Australia – which is about 6 million plants! Incidentally, the Botanical garden maintains several large databases of plants, such as “what is this called? – a list of scientific names ever used for Australian plants. Also available a huge collection of photos. Australian artist Tom Roberts was one of the first Australians, lobbying among Australian Prime Ministers for the establishment of national art gallery. In 1910, Prime Minister Andrew Fisher agreed to this proposal, and in 1911 the Australian Parliament established the Historic memorial Council, a bipartisan Committee composed of six political leaders. The Committee has decided that the government must collect portraits of Australian Governor-General, parliamentary leaders and the main “fathers” of the Australian Federation, written by Australian artists. This led to the establishment of the Advisory Council of the Commonwealth on matters of art”. Commonwealth Art Advisory Board, which until 1973 was responsible for the acquisition of various works of art (although this was also engaged in the Parliamentary library Committee, which was acquired for the national collection of different landscapes). 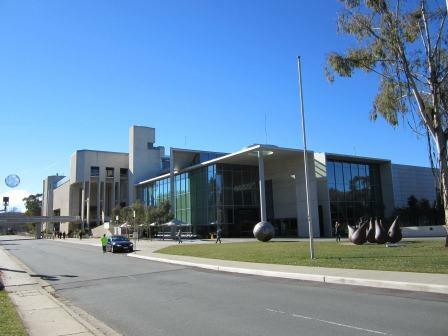 Before the opening of the building of the National gallery’s collection was exhibited in the Australian Parliament, diplomatic missions abroad and galleries of other States. Since 1912 the building of the National gallery was one of the priorities of the Advisory Board of the Commonwealth on matters of art. But because of the great depression and world wars, the solution to this problem was postponed because, according to the government, much more important was the creation of other infrastructure in the nation’s capital, Canberra, including the construction of the Parliament building, the artificial lake Burley Griffin and the National library of Australia. Only in 1965 the Advisory Council was able to convince the Prime Minister Robert Menzies in the need to start construction of the National gallery of Australia. 1 November 1967 Prime Minister Haroldo Hold was officially announced that the government will organize the construction. 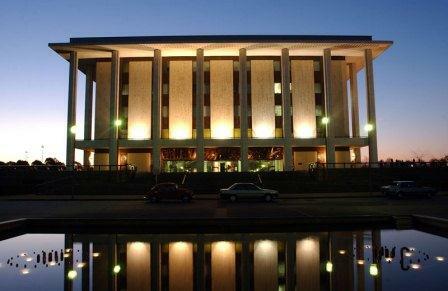 In the National library of Australia holds records relating to the history of the country, as well as a collection of rare books on Asia, the Pacific and far abroad. Weekly comers are invited to explore the library “zaculeu”. The library building, built in the style of a Greek temple, was discovered in 1968 year. Features of Greek architecture of the classical period emphasizes the marble and limestone, which covered columns and walls. The marble of different origin (Greece, Italy, Australia) and the colors used in the interior of the building. In the lobby you can see the stained glass Windows Leonard French and three woven from Australian wool obzansky tapestry. On the mezzanine you can see the layout of the ship captain cook in scale 1:24 and pictures of all Australian Prime Ministers. On the ground floor exhibited treasures of the library collection. 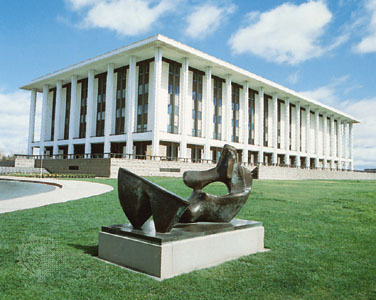 History of the National library of Australia stretches from 1901 year. The library was moved to Canberra from Melbourne in 1927 year. Initially, the national library was part of the parliamentary library, Commonwealth, but in 1960, the year it became an independent institution. Today the library contains more than three and a half million books, some of which was donated by volunteers. Here you can find rare printed editions of medieval manuscripts, Newspapers, music, autographs and manuscripts scientists, politicians and artists, as well as historical and contemporary photography and more than six thousand paintings. The most valuable exhibits – the journal of captain cook (1768-71) and diary of the wills of the expedition under the leadership of Robert Burke (1860-61), which ended with the death of the two travellers. 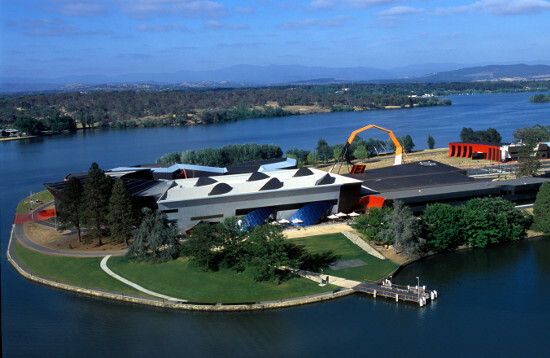 The National Museum of Australia was formally established by the National Museum of Australia Act 1980. 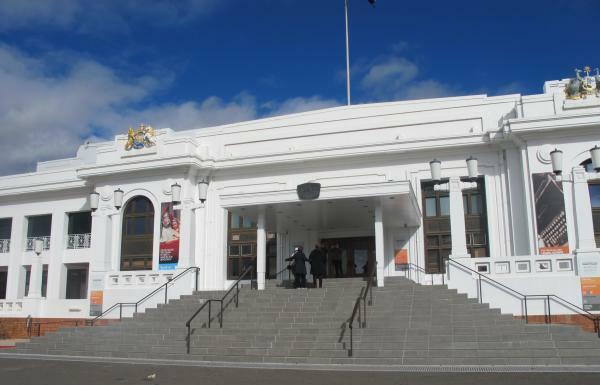 The National Museum preserves and interprets Australia’s social history, exploring the key issues, people and events that have shaped the nation. 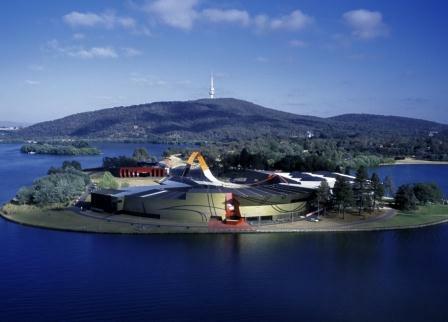 It did not have a permanent home until 11 March 2001, when it was officially opened in the national capital Canberra. 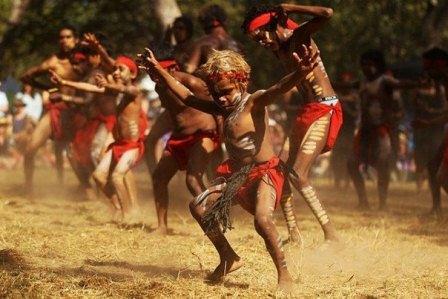 The Museum profiles 50,000 years of Indigenous heritage, settlement since 1788 and key events including Federation and the Sydney 2000 Olympics. 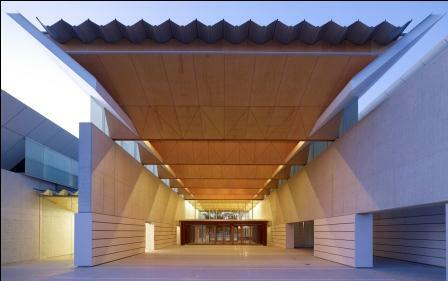 The Museum holds the world’s largest collection of Aboriginal bark paintings and stone tools, the heart of champion racehorse Phar Lap and the Holden prototype No. 1 car. The Museum also develops and travels exhibitions on subjects ranging from bushrangers to surf lifesaving. The National Museum of Australia Press publishes a wide range of books, catalogues and journals. The Museum’s Centre for Historical Research takes a cross-disciplinary approach to history, ensuring the museum is a lively forum for ideas and debate about Australia’s past, present and future. 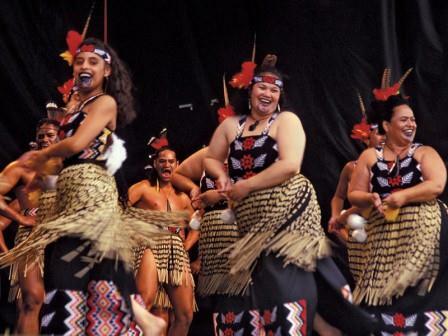 The Museum’s innovative use of new technologies has been central to its growing international reputation in outreach programming, particularly with regional communities. From 2003 to 2008, the Museum hosted Talkback Classroom, a student political forum. 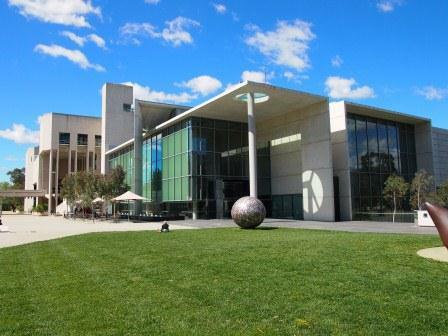 In 2005 and 2006 the National Museum was named Australia’s best major tourist attraction.